The 2015 conference will take place from 4 to 7 October with an Asian emphasis following an Italian 2014 which had over 12,000 visitors. At the latest San Sebastian Gastronomika-Euskadi Basque Country conference, the Peruvian Virgilio Martínez, whose restaurant is regarded as the number 1 in Latin America according to 50 Best, cooked using new ingredients discovered in the course of the 43 trips he has made across the country, like Andean potatoes and the Amazon coca leaf. Other stars of the day were Jordi Roca, who exhibited an ice cream combining sweet, bitter, sharp and savoury tastes; Martín Berasategui, Hilario Arbelaitz, Pepe Solla, Paco Pérez, Josean Alija and Eneko Atxa. What is more, today saw the 5 th National Grill Competition, in which the winners were Aitor Manterola of the restaurant Patxiku-Na and the supplier Cárnicas Guikarn. In Young Gastronomika about a hundred school children between 9 and 12 had the chance to cook alongside the big names in cooking. Between Sunday (popular day) and today, the Kursaal conference centre has experienced a real feast of stars of haute cuisine. They included Massimo Bottura (3 Michelin stars) who presented his new recipe book Never trust a skinny Italian chef Carlo Cracco and Gennaro Esposito and the Neapolitans Enzo Coccia (the world’s only pizza restaurant with a Michelin star), Raimondo Cinque (Pizzeria a Metro) and Enzo Piccirillo, the guru of the fried pizza. What is more, the inhabitants of Donostia-San Sebastian have had the chance to sample their pizzas at the entrance to the Kursaal where over 4,500 slices were sold over the 4 days of the conference. The best on the national scene also went up onto the stage at the Kursaal. Joan Roca presented iconic dishes like El Celler de Can Roca in collectible miniatures, Ángel León presented an exclusive edible plankton which he himself has turned into an ingredient. Other big names presenting their latest creations in Donostia-San Sebastian were Carme Ruscalleda, Hilario Aberlaitz, Karlos Arguiñano, Elena and Juan Mari Arzak, Pedro Subijana and Eneko Atxa. Besides cooking on stage, Andoni Luis Aduriz, Dani García, Quique Dacosta and Virgilio Martínez, among others, gave master classes for small groups of no more than 20 people. In this edition the conference also paid tribute to Pedro Arregui, the creator of Elkano, “the world’s best fish restaurant”, according to Karlos Arguiñano. 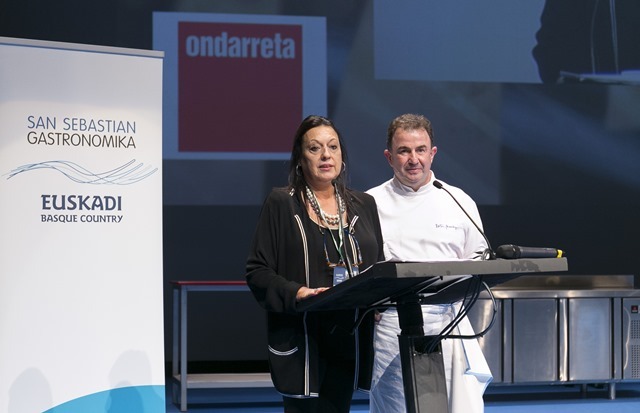 Gastronomika 2014 also paid tribute to the journalist Pau Arenós with the Pau Albornà i Torras award, and to Didier Fertilatti (Head Waiter at the Quique Dacosta Restaurant) with the Gold Gueridón. Gastronomika’s OFF section, in which wine is the main protagonist, had to put up a “Full” notice in all of its sessions, guided by experts like Walter Speller, Josep Roca and Luca Maroni. In the Wine & Win competition, which chooses the pair that know the most about wines, Jorge Orte Tudela and Michael Cooper were proclaimed the winners. In the Gastronomika Market representing over 100 top brands more than 45 tastings and product presentations were made. This edition saw the premiering of the Summum space, where it was possible to sample Agustí Torelló cava, Can Bech delicacies, foie Coll Verd, Ràfols cod, Gorrotxategui chocolate, etc. 18,900 interacting simultaneously over Facebook (total reach over the 4 days: over 112,000). The organisers of San Sebastian Gastronomika-Euskadi Basque Country, led by the Diario Vasco, Grup Gsr and Equinoccio Viajes, will be getting down to work from tomorrow onwards to prepare the 17th edition of the conference.